Like the alphabet of those Phoenician traders, this talk emerged from a deep-rooted need that TEDxBeirut has come to satisfy — the itch to speak out on the issues that matter to people here in Lebanon. The release of this talk comes at a particularly difficult moment for the Arabic language and for Lebanon, as both are still trying to find their place in the world. For both, the potential is all there: both are endowed with an amazing wealth of ideas. (The Arabic language can claim a vocabulary more than 12 million words; Lebanon can claim as many millions and more of its descendants scattered around the world.) Both are warm and well-connected. (The Lebanese are renowned for their hospitality; Arabic script is cursive, joining letters together like Lebanon joins different communities, and sparked traditions of literature and calligraphy.) Both can lay claim to a rich heritage. (Arabic gave the world Averroes and Avicenna; Lebanon gave the world Kahlil Gibran and Fairuz). Yet, all this potential is weighed down by baggage from the past. You may know that Lebanon went through a civil war from 1975 to 1990. Like Belgium in WWII, Lebanon became the fighting ground of many nations. Beirut, at its center, was the cosmopolitan scene where warring languages were, and still are, spoken. Not much has changed. Lebanon is more cosmopolitan than ever and even more hotly contested. The Lebanese continue to speak in different languages with each other, and public discourse focuses on issues beyond our borders — so much so that there is rarely an honest public conversation about the issues that affect the lives of people living here. This leaves people feeling helpless in affecting real change around them. It is a lot like the divide between formal and vernacular language in Arabic. Except the cost of the conversations we never have in Lebanon is hefty and paid for in intermittent violence as well as in gridlock in education, healthcare and the economy. It is no wonder why Lebanon, for all its Mediterranean charm, is also among the countries with the highest rates of depression in the world. We started TEDxBeirut as a way to share big ideas and real issues with a small local community. It grew, quickly and organically, to become the bearer of good news in Lebanon, a counterweight to our grim public life — which remains mute on issues like education or the economy. When we talk to people about TEDxBeirut, our speakers and the work they do, we see their faces light up as if they suddenly found hope again. Many of our speakers are over the age of 30. That means we have speakers who grew up in the civil war, who worked on rebuilding and who continue to do so. Most — if not all of them — grew up speaking at least two languages and — more likely — three as is the norm in Lebanon, where the native Arabic is also the least appreciated language. What makes these speakers so exceptional is their flair for addressing the toughest problems we face in Lebanon, from recycling (Ziad Abichaker: A garbage love story) to technology start-ups (Bassam Jalgha: Why can’t we have our own NASA?). The work these speakers do today shows the potential of their lost generation, which has so much more to give than war. TEDxBeirut puts these speaker front and center — in plain sight — for people to meet, learn from and be inspired by. Allowing this generation to be discovered sets off positive chain reactions with amazing effects. Beirut is brimming with incredible people with bold ideas. 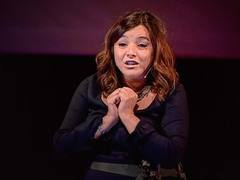 We loved Suzanne Talhouk‘s candor from the first moment we met her and, as we worked with her, her talk began to change how we talk and write in Arabic and how we think of our native language. It even began to change our habits. But the reception the talk received on the web went even further than we could have imagined. The talk went viral soon after it was posted, and it unleashed a conversation between Arabic speakers from Morocco to Iraq, and the curious from across the globe. Suzanne’s movement, which started in Lebanon, was soon enthusiastically carried forward by volunteers to countries like Jordan. Lebanon is a place that can be difficult and, at times, violent. But we at TEDxBeirut choose to press on and be witnesses to the good news and hidden heroes working here. Otherwise, we’d miss the greatest opportunity of all: to stand for something more than the sum of our parts. That is everything to us. Now, on with the conversation — in as many languages as possible. Avicenna – one of the most important physicists of all time – was NOT from the Arab world. He was Persian – from the very East: Bukhara (Now Central Asia/Uzbekistan). New Persian disseminated from Bukhara. Even the link you refer to clearly mentions him as Persian. So I wonder why you refer to him as “Arabic”?! Avicenna actually fostered New Persian as a scientific language – which was very uncommon at that time. Pingback: Publishing Opinions | Is the Popularity of English ‘Killing’ Other Languages? Reblogged this on Mich's Journal.